A Delhi Police officer had to face the brunt of taking “blessings” from a self-styled godwoman while on duty. 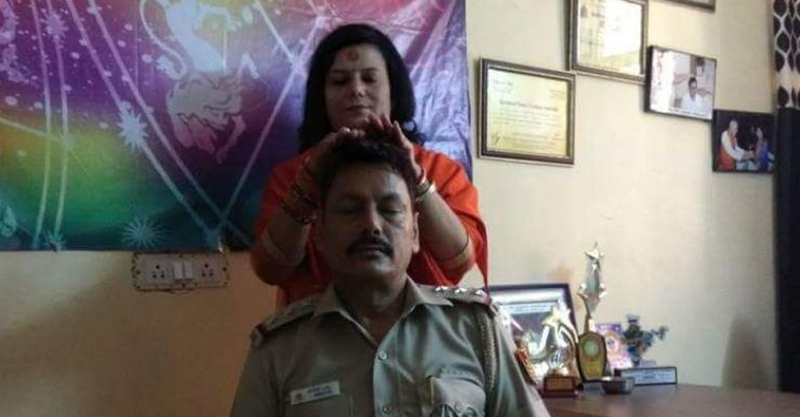 The station house officer (SHO) of Janakpuri in West Delhi has paid dearly after the photo of him went viral where he can be seen taking “blessing” of godwoman Namita Acharya while wearing his uniform. The officer has now been transferred to an insignificant post and a vigilance inquiry has been initiated against him. In the viral-picture, the officer is seen in his uniform with his eyes shut as the saffron-robed Namita Acharya, who calls herself a sadhvi, is seen standing behind him in a gesture of blessing. The photo appears to have been taken in his office. According to reports, the officer felt “stressed” and therefore decided to give “energy healing” a shot. Namita Acharya is reported to be a high-profile godwoman who has previously been seen with many civil servants and IPS officers. In October last year, a group of policemen landed into trouble after another self-styled godwoman Radhe Maa was given a special treatment at a different police station in Delhi. The station house officer of the Vivek Vihar police station had offered his seat to Radhe Maa and had also worn her chunari to offer his respect to the godwoman. Policemen were also seen singing and dancing with her on video. The policemen were suspended and transferred. Radhe Maa was apparently on her way to a Ram Lila event when she decided to stop at a police station to use the washroom. A widely-shared video showed a group of policemen grooving with Radhe Maa to patriotic songs.